Elegant Edwardian Studio Flat near Oval Tube in London is an apartment building. Set 2.1 km from O2 Academy Brixton, 3.9 km from London Eye and 4 km from Houses of Parliament, Elegant Edwardian Studio Flat near Oval Tube provides accommodation situated in London. It is located 4.3 km from Westminster Abbey and offers free WiFi. The apartment is located on the ground floor and comes with 1 bedroom, a TV with satellite channels and a fully equipped kitchen that provides guests with a dishwasher and an oven. The apartment also features a seating area and 1 bathroom with a showe...r. Big Ben is 4.4 km from the apartment, while Borough Market is 5 km from the property. The nearest airport is London City Airport, 16 km from the property. 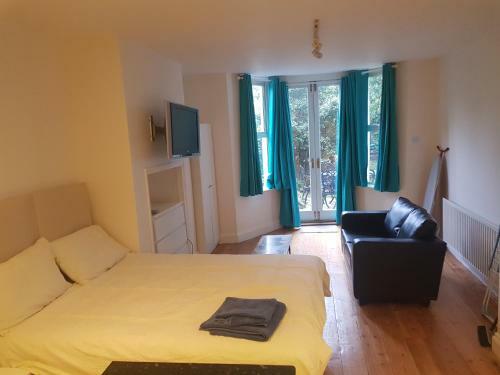 Set 2.1 km from O2 Academy Brixton, 3.9 km from London Eye and 4 km from Houses of Parliament, Elegant Edwardian Studio Flat near Oval Tube provides a...ccommodation situated in London. It is located 4.3 km from Westminster Abbey and offers free WiFi. The apartment is located on the ground floor and comes with 1 bedroom, a TV with satellite channels and a fully equipped kitchen that provides guests with a dishwasher and an oven. The apartment also features a seating area and 1 bathroom with a shower. Big Ben is 4.4 km from the apartment, while Borough Market is 5 km from the property. The nearest airport is London City Airport, 16 km from the property. When would you like to stay at Elegant Edwardian Studio Flat near Oval Tube? Please inform Elegant Edwardian Studio Flat near Oval Tube in advance of your expected arrival time. You can use the Special Requests box when booking, or contact the property directly with the contact details provided in your confirmation.